Divert calls to another number or Voicemail when you're on the phone or away from your desk. Includes external and mobile numbers, as well as other phones on your network. Use Call Forwarding to set other numbers on your network to ring when your phone rings, or twin your phone with your mobile. Know when another caller is waiting to get through with Call Waiting, and use Call Park to put a caller on hold while you answer another call. Know when you have a message waiting with on-screen pop-ups, SMS text messages and email alerts. Respond immediately with Last Number Redial and Click-2-Talk. Easily manage all your contact lists with your personal and company Address Books. Never forget to make those important calls - use Events Diary to set reminders against your Address Book entries. Forward you calls to any internal phone, your mobile or external phone. Access Voicemail from any internal phone, your mobile or external phone, or on-line. Let the whole team know with messages on shared voicemail. Help your customers' calls get through with Call Groups. 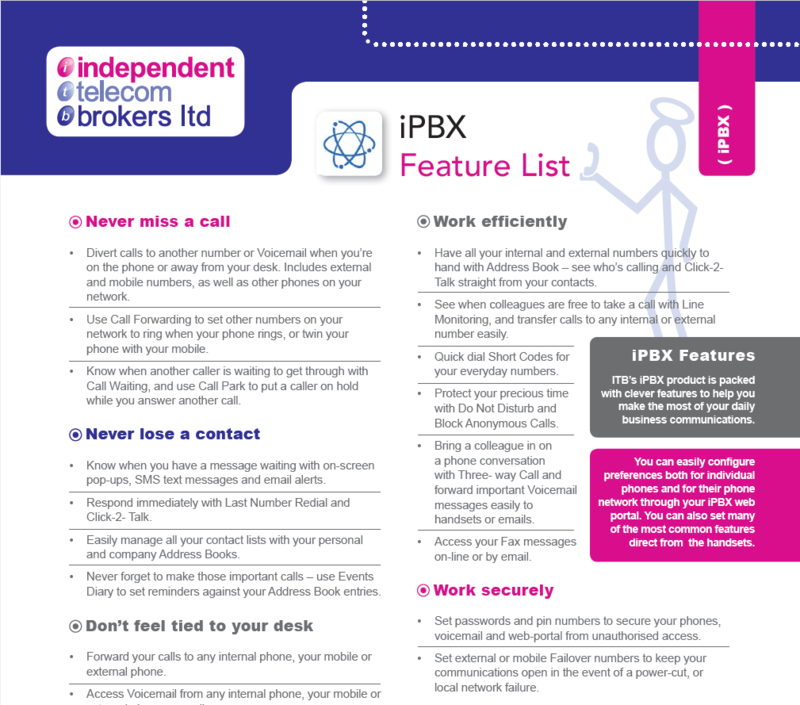 Have all your internal and external numbers quickly to hand with Address Book - see who's calling and Click-2-Talk straight from your contacts. See when colleagues are free to take a call with Line Monitoring, and transfer calls to any internal or external number easily. Quick dial Short Codes for your everyday numbers. Protect your precious time with Do Not Disturb and Block Anonymous Calls. bring a colleague in on a phone conversation with Three-way Call and forward important Voicemail messages easily to handsets or emails. Access your Fax messages on-line or by email. Set passwords and pin numbers to secure your phones. Set external or mobile Failover numbers to keep your communications open in the event of a power-cut, or local network failure. Update, add or remove users. Set up Call Groups, shared Voicemail boxes and Music on Hold. Create a shared company Address Book and an automatic internal telephone directory. Track and bar unauthorised calls. Monitor your phones account and company Calls History, and create automatic Company Reports.